Research into the emotions is beginning to gain momentum in Anglo-Saxon studies. In order to integrate early medieval Britain into the wider scholarly research into the history of emotions (a major theme in other fields and a key field in interdisciplinary studies), this volume brings together established scholars, who have already made significant contributions to the study of Anglo-Saxon mental and emotional life, with younger scholars. The volume presents a tight focus - on emotion (rather than psychological life more generally), on Anglo-Saxon England and on language and literature - with contrasting approaches that will open up debate. The volume considers a range of methodologies and theoretical perspectives, examines the interplay of emotion and textuality, explores how emotion is conveyed through gesture, interrogates emotions in religious devotional literature, and considers the place of emotion in heroic culture. 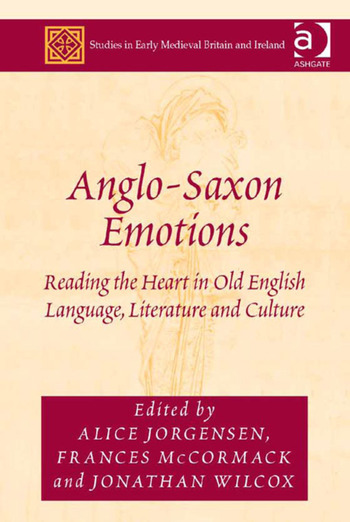 Each chapter asks questions about what is culturally distinctive about emotion in Anglo-Saxon England and what interpretative moves have to be made to read emotion in Old English texts, as well as considering how ideas about and representations of emotion might relate to lived experience. Taken together the essays in this collection indicate the current state of the field and preview important work to come. By exploring methodologies and materials for the study of Anglo-Saxon emotions, particularly focusing on Old English language and literature, it will both stimulate further study within the discipline and make a distinctive contribution to the wider interdisciplinary conversation about emotions. Alice Jorgensen is Assistant Professor of English to 1500 at Trinity College, Dublin. She is the editor of Reading the Anglo-Saxon Chronicle: Language, Literature, History (2010) and has published variously on Old English literature, including articles on shame in Anglo-Saxon England and English Studies. Frances McCormack is lecturer in English at the National University of Ireland, Galway, and author of Chaucer and the Culture of Dissent: The Lollard Context and Subtext of the Parson’s Tale (2007). Jonathan Wilcox is the John C. Gerber Professor and Chair of the English Department at the University of Iowa, USA, and editor of Scraped, Stroked and Bound: Materially Engaged Readings of Medieval Manuscripts (2013).